A picture of Zimbabwe’s President Mnangagwa showing an extravagant Gucci briefcase which is said to cost at $8,600 has received a mixed reactions on the internet with some people saying the president’s priorities are misplaced. 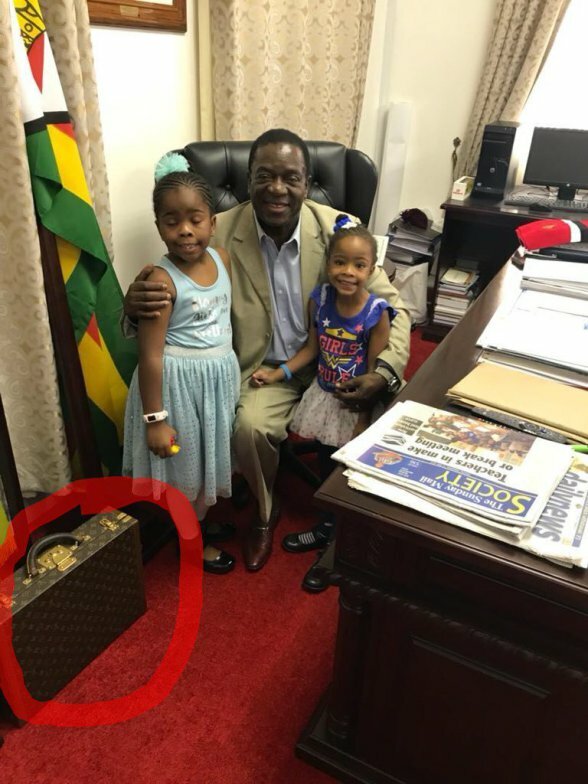 In the alleged picture, the president can be seen in his office hugging two little girls while the Louis Vuitton limited edition presidential briefcase is seen placed on the floor. People’s reactions to the picture have questioned if the President really knows the cost at which majority of Zimbabweans survives per day. “Mnangagwa’s briefcase is worth $8,600. While the majority is surviving on less than a $1 a day‚ this is a clear case of a life of extravagance and greediness. Zanu doesn’t care about the poor‚” tweeted @maDube_. Meanwhile, some reports indicate that the ex-president of Zimbabwe Robert Mugabe was also fashionista just like his wife Grace Mugabe who went to the extent of being branded the name “Gucci Grace”. On numerous occasions Mugabe was spotted wearing Rolex wrist watches on both arms. The 94-year-old former president was said to be “buying his time”. All in all, the fact remains that being the president of the republic of Zimbabwe is not a cheap business – and the briefcase in mention backs up that statement.